Weeks after a speculated Mad About You revival was discussed, actor Louis Zorich has passed away, aged 93. Zorich played patriarch Burt Buchman from 1993-99, the father of Paul Reiser's character. Although Zorich was a recurring presence, he managed to amass 70 appearances of the 162 episodes produced. Mad About You reached the Top 30 for four of its seven reasons, peaking in 11th place during the 1994-95 season as it was one of NBC's hottest Must-See-TV commodities that season before being bounced around the network's schedule. Born February 12, 1924, Zorich held an extensive resume of credits from 1958-2016. Zorich was no stranger to television, gracing CBS' Brooklyn Bridge from 1991-93 as Jules Berger as well as making guest appearances on shows such as Columbo and Law & Order. 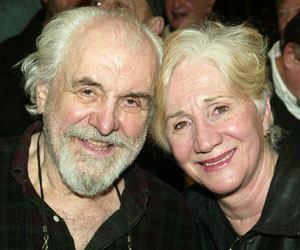 He was married for over 55 years to film legend Olympia Dukakis and is survived by their three children. In addition to nearly 60 years of television credits, Zorich and Dukakis operated Montclair, New Jersey's Whole Theater Company from 1973-88.